Hello! 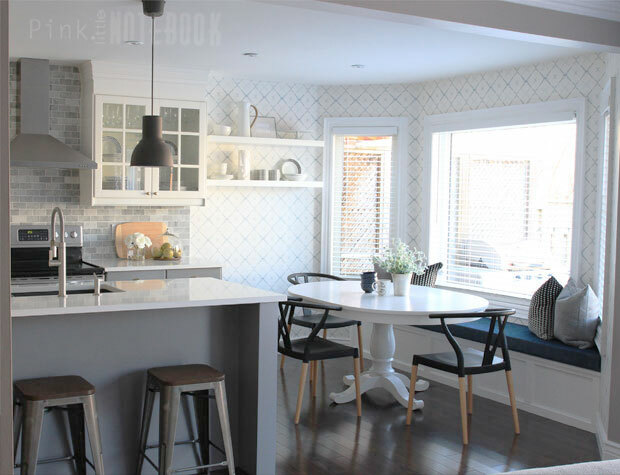 Today’s the day I finally share my kitchen makeover! It’s been a long time in the making (2 years to be exact) and what a huge transformation its been. 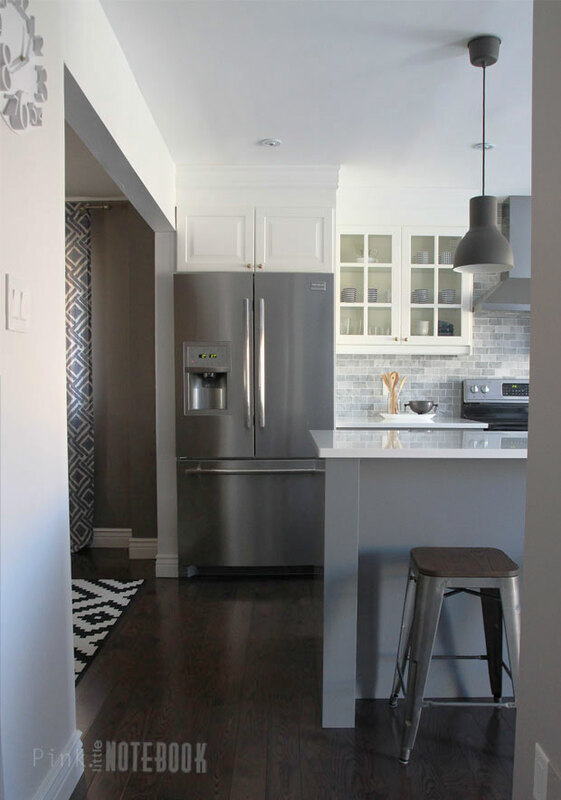 This kitchen remodel contains a lot of DIY projects, an updated colour palette and a new use of our space. Since our kitchen is small, we decided to do everything ourselves. This is the first time we actually gutted a kitchen and started from scratch (see more here and here). 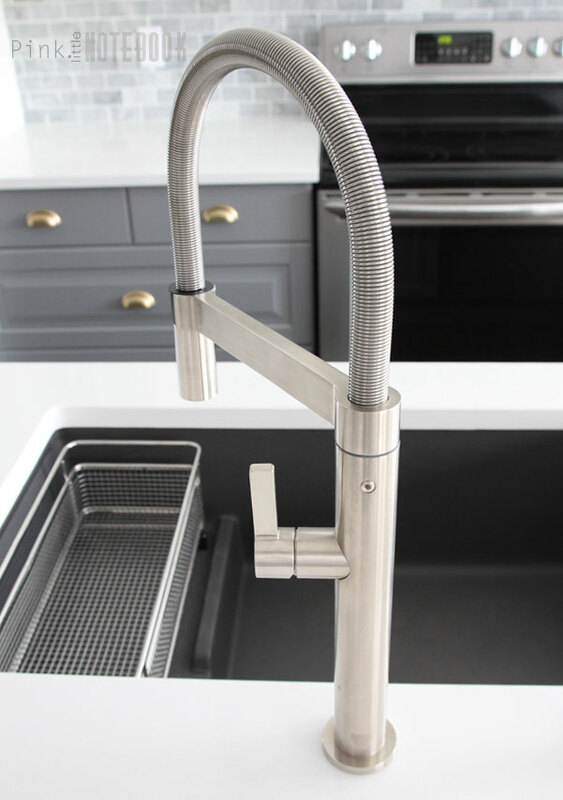 To save on the budget, we installed big box store cabinets from IKEA and paired it with professional grade materials like our Blanco sink and faucet, our marble backsplash and quartz countertops. 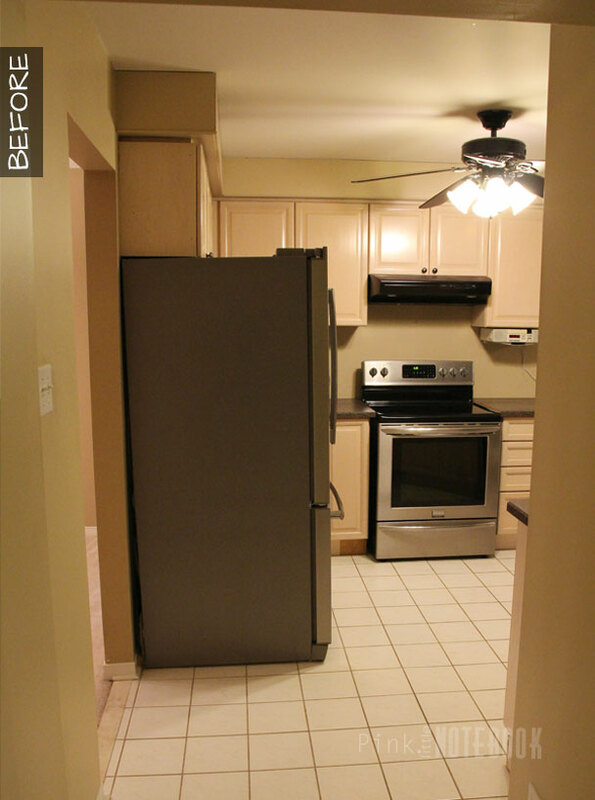 As you may recall, the doorway between the dining room and kitchen was enlarged to achieve an open concept main floor, the fridge was relocated and the kitchen island was reconfigured. We did purchase our cabinets during the IKEA Kitchen Event. Although I love getting money back, we did experience a lot of out of stock pieces which meant we had to wait before starting anything. We used base cabinets to create the kitchen island which also doubles as the home to our sink and dishwasher. 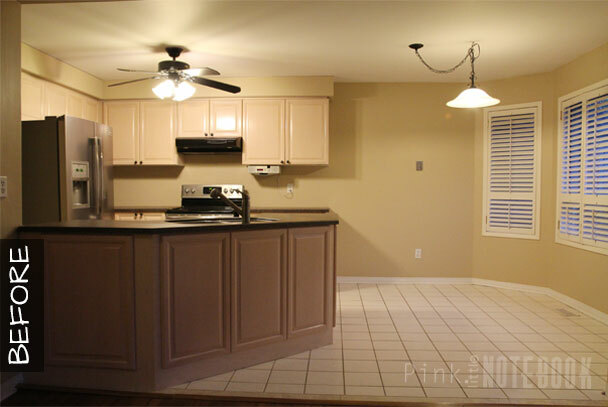 At the time, it was nearly impossible to find any instructions on how to create a free standing IKEA kitchen island, which is why I put together this post here. Let’s just say, it’s definitely not a beginner’s project! We were able to assemble the cabinets in one night and it took us another two nights to install everything in place. I will admit, if we had a bigger kitchen to deal with, I probably would have hired someone to deal with the nitty gritty. There’s a lot of boxes. 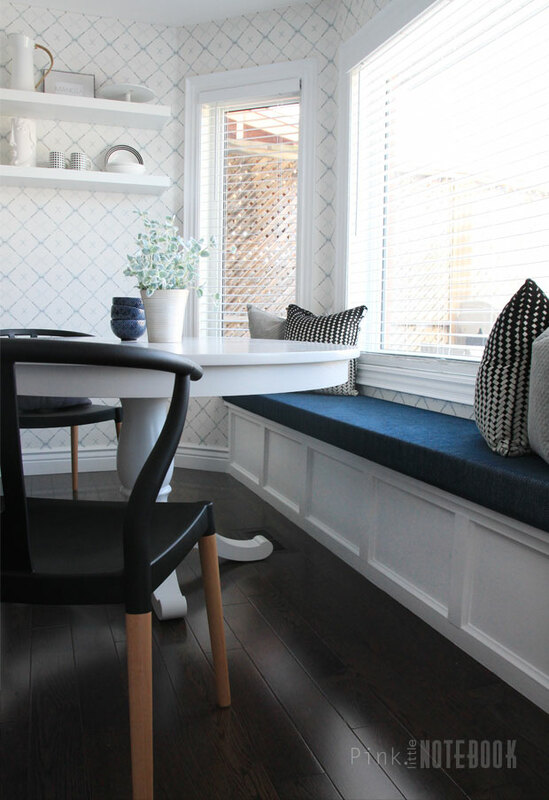 The breakfast nook which was the last project completed in the kitchen has to be my favourite. 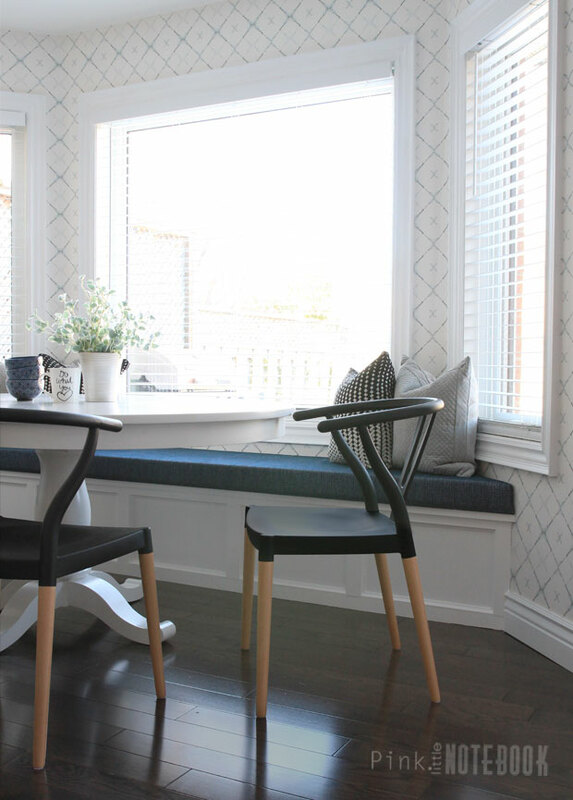 The Dagfinn Modern Trellis wallpaper and built-in bench make this space finally feel like a cozy home. We’ve really been enjoying family gatherings around this table! The floating shelves are a great solution to add more storage to our kitchen. It’s also a fun way to display my favourite items which I can easily change up from time to time. 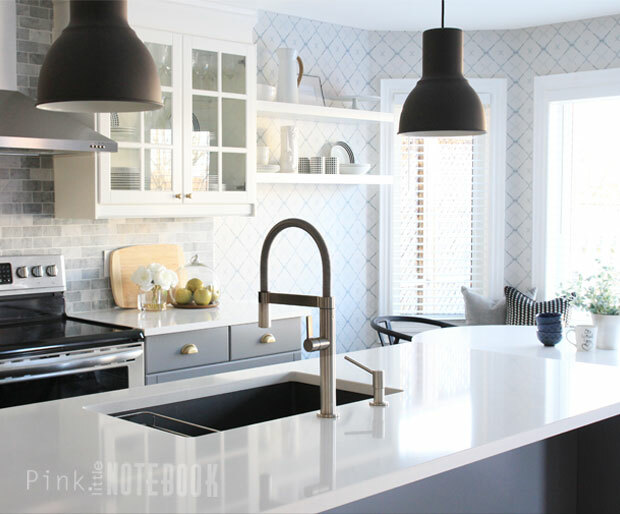 *Click through these links to see more about our kitchen plans, kitchen sink, creating an IKEA island, how to disguise a kitchen soffit, a kitchen recap, about our wallpaper, DIY built-in bench, DIY upholstered bench seat and about our kitchen chairs. **Want to see more of the adjoining room? 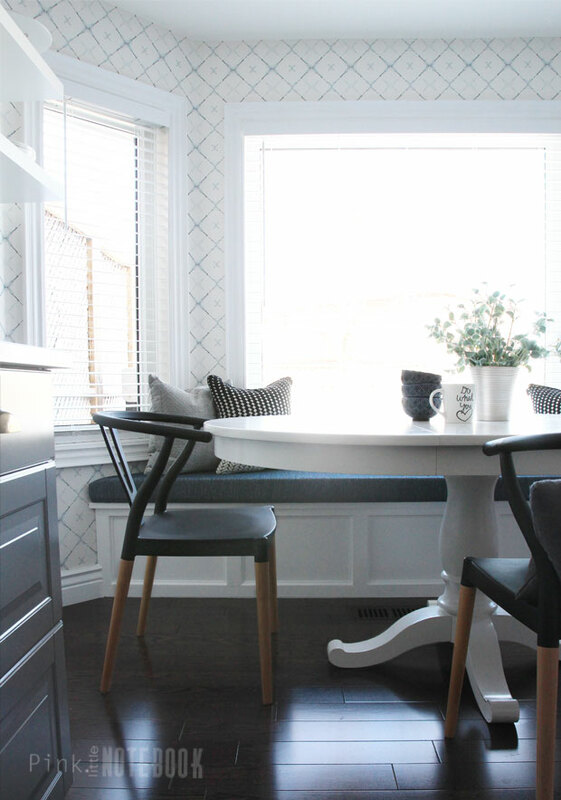 Check out our dining/living room makeover and family room makeover. Lovely! You’ve gone from beige to bright. Wow! This kitchen is so amazing. What a wonderful job you both did. Love the way you used colours and made the most of space. Congrats! This is such a great DIY project! 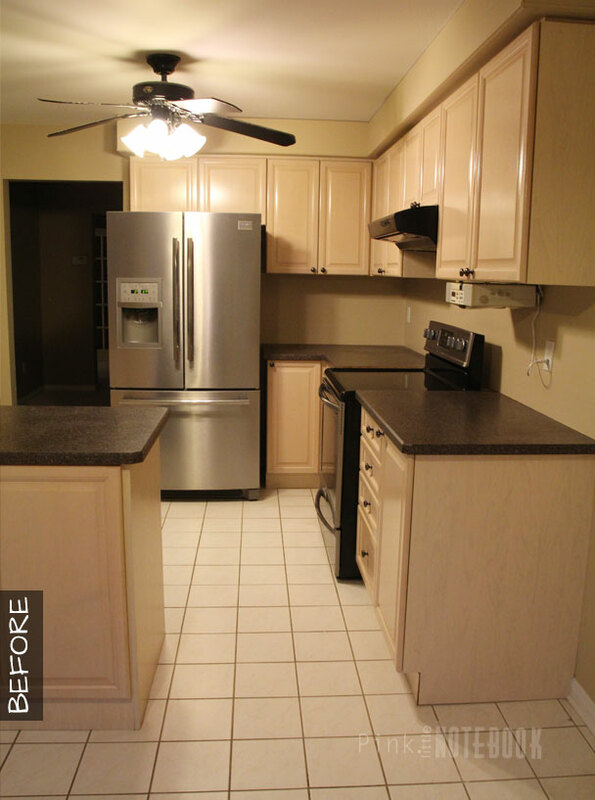 Your kitchen turned out amazing!!! You did a great job! I absolutely love your kitchen. The lighter colors made it so much more airy and so much light. Amazing how different the before and after look. I am definitely pinning this for inspiration for when we start updating our kitchen. Wow, what a dramatic difference! LOVE the new space! So bright and actually looks much bigger! I want your countertops so badly!! Great job! The dark wood floor looks fantastic, very contemporary! We are looking at ordering our kitchen this week during the IKEA kitchen sale. I have had the plans on the kitchen planner since December. Your island/entire kitchen is super similar to our dimensions – even down to the bench near the window! Definitely sending this over to my husband to look at! Your kitchen looks fabulous! Great makeover! Stop by when you get a chance. Stunning! A beautiful transformation! Pinned to share. Thanks for taking the time to stop in and share it with us at Brag About It! This is totally a Brag About It makeover! Have a great week. Oddly when we worked with the IKEA staffer,—at the store, he was helpful in adding what we needed to finish the island without any problems at all. We had 137 boxes and the rest was fittings. Three trips back and forth to add/subtract our errors/their errors and we are thrilled with our kitchen. Ours took longer, but we had some very major construction issues with the house itself, not the cabinets there than they are very heavy—for two old people to wrangle. Wow, this is gorgeous! I love the sleek contemporary look and taking pictures in this space must be a joy. Thank you for sharing with us this week at Celebrate Your Story, have a great weekend. WOW! It looks like a kitchen featured in a magazine! What an amazing job you did! I will be anxious to hear how your IKEA cabinets hold up! I have considered them, but have been hesitant! Thanks so much for sharing at Celebrate Your Story! Your kitchen turned out beautifully! This is such an excellent idea Sabrina. 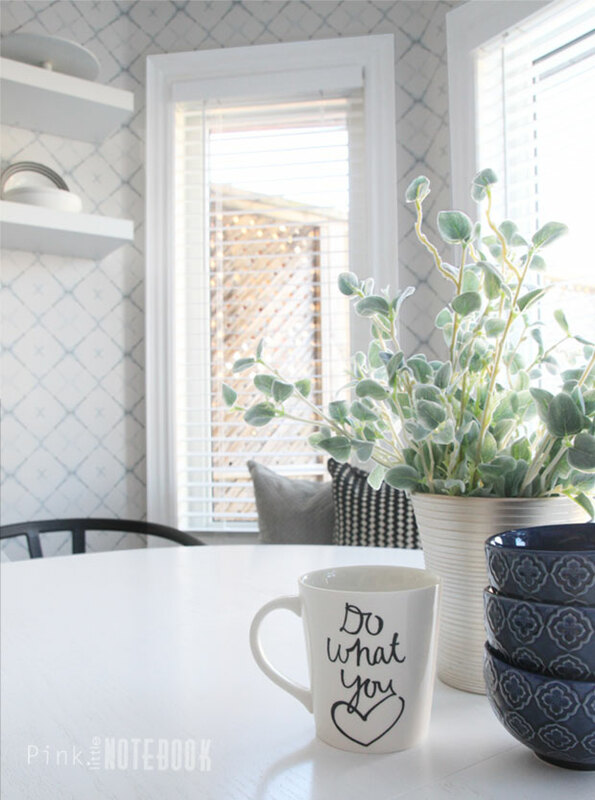 Making my own “Our DIY Kitchen – Before & After” has always been a task I kept postponing because of my lack of confidence in doing it on my own. You made me feel assured that I can really do it! Just a quick question, do you have a rough estimate of the cost of this project? Stainless steel furniture and black tile flooring. Be careful what you wish for. Been there. Sabrina – this is a very nice job. Don’t listen to the haters… Jan . Very inspired by what you’ve done. Did you decide to keep the stools? Any thoughts on where to find good ones? I haven’t found a good source yet. Thanks for your kind words Sandy! I did keep the stools. I find the best places to check are HomeSense/Home Goods. You always have to be on the lookout but they have the best styles & prices. Hi….what color is the sink? I have am trying to decide between the cinder and the metallic gray. My kitchen is white backsplash, white counters, slate with mixed in brown floors. You did a fantastic job!! I love how bright it is now and the appearance of a larger kitchen than you actually have. Thanks for the review on the Blanco sink, we’re building a house and I liked the reviews on the Ikea cabinets and sink. Makes me reaffirm my choices!! Thanks so much Miriam! Glad I was able to provide some insight for you. All the best with your new build!! Excellent job. The kitchen look like in the magazine. We are in the process of doing the same island style (Thank you for your post) but longer (11.5 feet long x 3 feet wide) and the overhang (sitting area) is about 11.5 inches with Quart counter top. Wonder if you use support bracket on your overhang area? Our counter top guy said we need some sort of bracket. We have the 2 sides support wall like yours. Thanks in advance.